Ahhh... we all need a good nights sleep huh? Well this month it's all about getting the right amount of sleep and sticking to it! I am so sporadic (having 4 kids can do that to you!) with 5 hours sleep here, 6 1/2 there - 8 hours if I'm lucky! That's why I am dedicating myself to get to bed early this month! Will you join me? If so add your details at the end of this post, as I will be gifting those that participate with a little slumber gift. For healthy bodies and minds, it is recommended by experts that people should be aiming at a solid seven-hour minimum but let’s take things one at a time. Even if your schedule for now means that you cannot reach that golden milestone of good sleep hours, then what I want you to do, at least, is flip your day. Instead of sending those emails at 11.30pm at night, try doing early morning messaging instead. It’s not ideal but the clincher here is that you do need to get away from the screen in the hours just before bed. Time to switch off that technology, TV and chill out 1hr before bed and read a book instead or meditate, just be still. For me, this weekend was a "fly by the seat of your pants" type of weekend, from sleepless nights, gastro and a visit to emergency at Tweed Heads hospital (thankfully only glue stitches under Zali's chin) our little getaway up to the Sunshine Coast will have to wait for another weekend. All in all, Zali was a trooper falling off her bike and making it on the toilet on time for sloppy number two's.... to not so making it to the toilet, when the waterworks were coming from her mouth. You can't win them all. She is getting better and resting as I type but just to be safe, I've still got a bowl beside her - just in case! Me on the other hand, I went a little too hard at the calf raises on the reformer machine at my pilates class last Thursday - and I have a severe case of delayed onset muscle soreness (DOMS) in my right calf which is causing me phenomenal muscle pain! This muscle soreness or muscle stiffness usually occurs in the day or two after exercise OR if you are like me and haven't done ANY calf training in a while, then this tends to happen. So take it from me and take it easy, don't try had be a hero and max out your reps! In order to repair and recover, I have been resting, icing, compressing and elevating (R.I.C.E) my calf and going to my Physio later this morning to get it checked out. After all I am flying out to Canberra for the BIG test drive and media launch of the new Volvo XC90, so I need to make sure I can put the pedal to the metal. Okay, now about last Friday night's dinner over on Instagram. 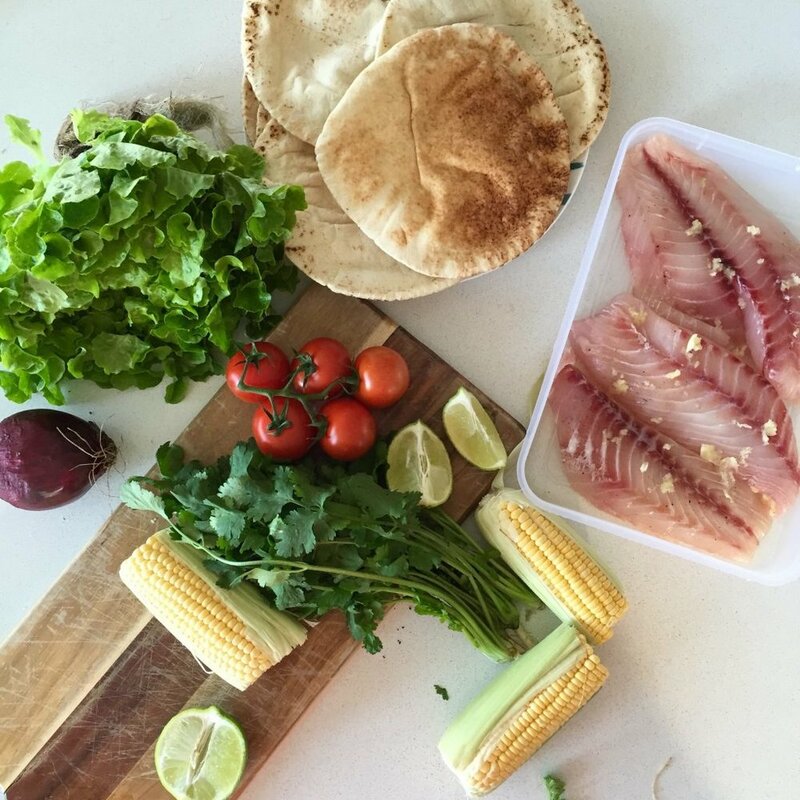 Here are our super easy fish taco's that take minutes to prepare and cook. You can either grill the fish, healthy style or crumb them which Adrian prefers, dust with flour, whisk eggs and coat fish or cut them into small pieces (I do the entire fillets and then cut after they've been cooked to save time) and shallow fry in olive oil until golden brown. I then chopped up this delicious salsa and squeezed lime juice over the chopped coriander, tomatoes, red onion. So delish. 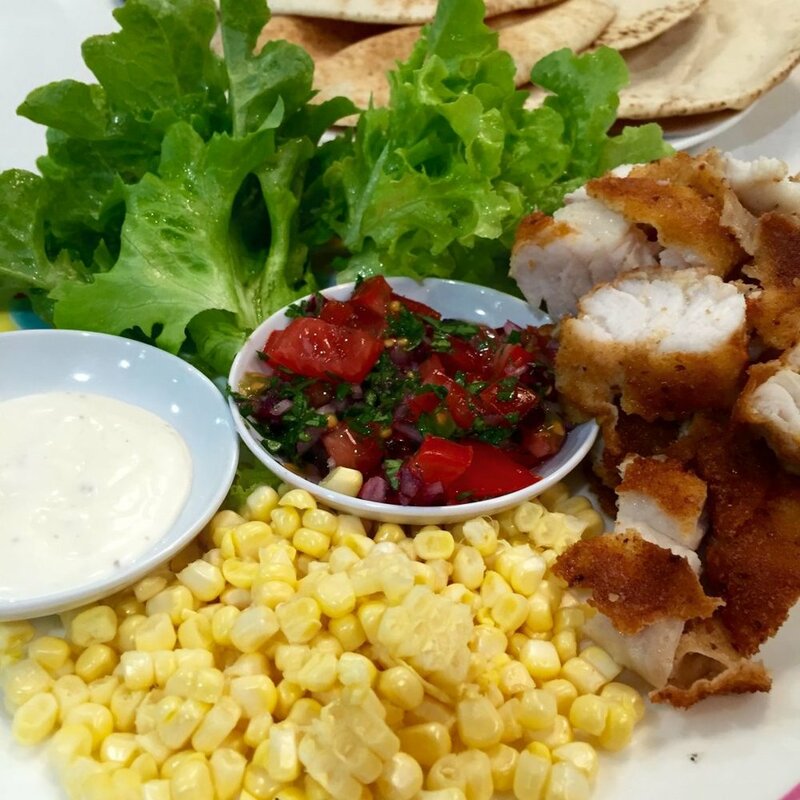 Serve with aioli and layer your fish and lettuce. Easy peasy. Lemon squeezey. I ended up having an open plate but I do adore the Turkish pita bread but have had loads of bread this weekend, so I was giving my belly some dough free time! Don't forget about this months challenge. Leave me a comment in my daily posts here or simply tag me #DaniStevens on Instagram, Facebook or Twitter throughout your day and tell me how many hours of sleep you got. Adrian and I couldn't stop cracking up when I asked Noah to take a picture for our challenge this month. I call this sleeping with a smile! So make sure you get to bed early tonight, promise?